The 2nd part of Christie’s Impressionist and Modern art sales will take place on a new date, Thursday May 14, with Christie’s traditional Evening Sale of Impressionist and Modern Art, led by two superb examples from the era: Monet’s Les Meules à Giverny ($12-18 million) (below) and Piet Mondrian’s Composition No. III (Composition with Red, Blue, Yellow and Black) ($15-25 million; , and anchored by offerings from the Collection of John C. Whitehead, the late former chairman of Goldman Sachs. Mr. Whitehead, who passed away in February, was among the captains of the global finance industry for four decades, having served as Chairman of Goldman Sachs during its critical phase of global expansion. His signature brand of quiet leadership earned him both success and accolades, making him a sought-after leader and an invaluable resource within finance and government sectors, as well as the philanthropic and educational community. He became a key diplomatic figure at the end of the Cold War, serving as Deputy Secretary of State during the Reagan administration, and later as Chairman of the Federal Reserve Bank of New York. He led numerous civic and charitable organizations during his storied career, and in the wake of 9/11, he answered the call to serve as chairman of the Lower Manhattan Development Corporation, tasked with rebuilding the area around Ground Zero. Throughout his career, he served on a wide range of boards, including Haverford College, the International Rescue Committee, the Boy Scouts of America, and Christie’s own American Advisory Board, among many others. Among the star works from the Whitehead Collection to be featured within the May Evening Sale are Amedeo Modigliani’s Portrait de Béatrice Hastings from 1916 (US$7-10million) and Claude Monet’s Paysage de matin (Giverny) (US$6-8million;). Together, these works depict the sweeping range of the collection; Modigliani’s portrait representing the dynamism of the European Avant-Garde and Monet’s landscape evoking the purity of French Impressionism with its revelry in light. This dynamic portrait depicts Modigliani’s muse Béatrice Hastings, one of many pen names for South African writer, poet and literary critic, Emily Alice Haigh. Hastings frequently posed for Modigliani, with whom she shared an apartment in Monteparnasse. 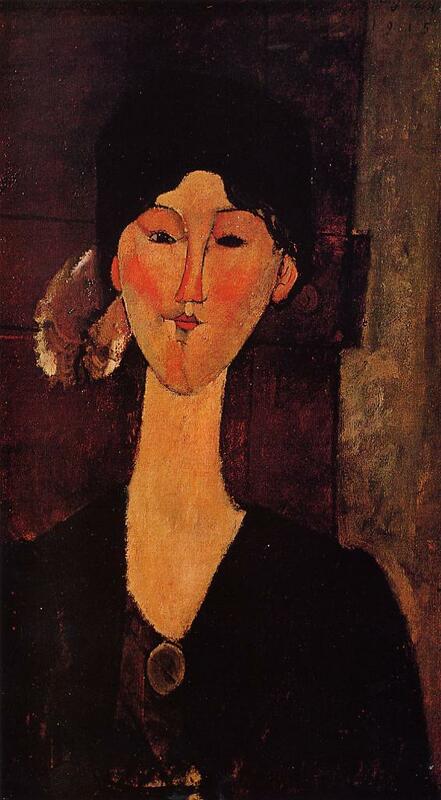 Modigliani used portraiture, especially of those in his immediate circle, as a means to explore an idealised aspect of humanity, an image of internal as well as external likeness. With its expressive painterly surface, Béatrice Hastings, is in glorious physical condition, giving it the appearance of just having left the easel. Paysage de matin (Giverny) is a consummate example of the luminescent landscapes completed by Monet during his distinguished middle career. Monet executed these works by situating himself in the midst of the French countryside with the hopes of encapsulating the light and conditions of a summer day within his canvases. Paysage de matin is an exceptional illustration of Monet’s ability to capture the light effects of his beloved Giverny. The present work is representative of Monet’s most sought after qualities, contributing to its broad global appeal. This idyllic, summertime view of the countryside in Giverny where Monet made his home is an important precursor to the iconic Haystacks series of 1890-91. Estimated at US$12-18 million, the painting has never been offered at auction previously, and now is being sold pursuant to a settlement agreement between the consignor and the heirs of René Gimpel, the esteemed French art dealer. Monet painted Les meules à Giverny during the high summer of 1885, two years after he had moved with his wife and family to the tiny rural hamlet that is now indelibly linked with his name. On this particular day, Monet set off for La Prairie, a vast pasture near his home, with his wife Alice Hoschedé and their three youngest children, all of whom are featured at the left in the finished painting. The scene’s haystacks are the most prominent feature in the landscape; the front face of each haystack is awash in golden light, rendered in vigorous touches of yellow and peach, while the far side has sunken into shades of deep purple and pink. Adrien Meyer, International Director, Impressionist & Modern Art, remarked: "This magical painting features the rare combination of some of the most iconic subjects by the artist: poplars, haystacks and Alice wandering with her umbrella. At a time of a growing scarcity for legendary subjects by this great master, it is a true event to feature at auction for the very first time such a desirable painting." Pleased with the success of Les meules à Giverny, as well as three earlier depictions of haystacks Monet completed from nearly the same vantage point the previous summer, Monet would famously return to this motif in 1890, to embark on the iconic Meules series that became of one the crowning achievements of his long career. For Monet, the haystacks were indivisible from his sense of national pride; they represented the local farmers’ livelihood, the fruits of their labors and their hopes for the future. With their exquisitely nuanced description of the fleeting effects of light, the paintings from La Prairie helped Monet re-assert French Impressionism’s vitality at the turn of the century and build new audiences among New World collectors and patrons. In 1886, Monet’s dealer Paul Durand-Ruel purchased the painting direct from Monet’s studio and brought it to New York soon after his new gallery opened there in 1888. Frank Thomson, a prominent American railroad executive and one of the earliest patrons of Impressionism in Philadelphia, purchased the painting and added it to his growing collection, and passed it on to his daughter upon his death. By 1931, the painting had passed into the collection of the prominent French dealer René Gimpel, whose Journal d'un collectionneur (The Diary of an Art Dealer) famously chronicles the rise of the modern art market between the two World Wars. A keen observer and a witty, sometimes acerbic writer, Gimpel documented his relationships with cultural luminaries from Picasso to Proust, with competing art dealers, and with American mega-collectors such as Henry Clay Frick, Henry Ford, and John D. Rockefeller. He described visiting the aging Monet at Giverny, where he had the opportunity to admire Les grandes décorations – the massive mural series that took him 10 years to complete – and to purchase paintings directly from the artist’s studio. During WWII, Gimpel and his sons took active part in the Resistance. René was first interned by the Vichy authorities in 1942 for his underground activities, and released in 1943, but then re-arrested by the Germans in July 1944. Much of his collection was lost or sold under duress. In confinement, he taught English to his fellow prisoners in preparation, he said, for the impending liberation; he died, however, at Neuengamme concentration camp before that day could come. After the war, two of Gimpel's sons, Charles and Peter, founded the Gimpel Fils gallery in London, carrying on their father’s celebrated legacy.